Blended learning is a hybrid of classroom and on-line learning that includes some of the conveniences of on-line courses without the complete loss of face-to-face tact. Purpose: The purpose of this study was to evaluate student achievement and satisfaction with blended learning course delivery compared to a traditional face-to-face class format in a general health course. Method: Surveys were distributed to randomly selected classes during the fall 2007 semester: three blended and one traditional sections participated (n=251). Results: Total satisfaction scores between blended (54.986) and traditional (49.788) classes were significantly different (p< 0.01). Achievement by students of blended and traditional sections brought mixed findings, yet blended students’ overall grades were significantly higher (p=0.048). 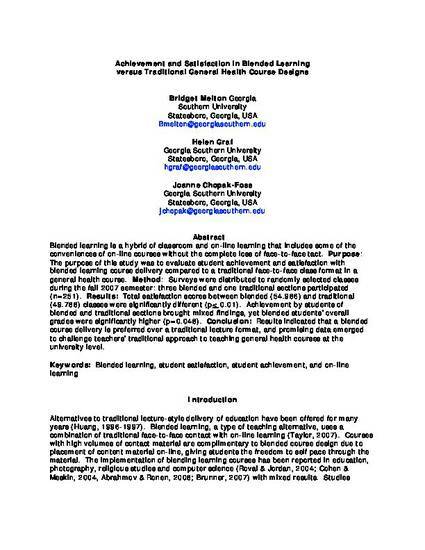 Conclusion: Results indicated that a blended course delivery is preferred over a traditional lecture format, and promising data emerged to challenge teachers’ traditional approach to teaching general health courses at the university level.